Close-up is the concept store of Katja Retsin and Barbara Jansen – alias Kate and Jane. The ladies have put down a strong brand in the retail landscape with their four stores. The idea to start a fifth store became a very different story. After a few exploratory conversations this resulted in the choice for a webshop. You can read here how we have approached this project. The target audience of Close-Up are young women with a smartphone, tablet, laptop or desktop. Many even have one of each :-). The devices that they are browsing with can vary: in the daytime on the computer at work, during lunch break on their smartphone and in the evening on their tablet in the armchair. It was very important to create a shop that responds to different screen resolutions, that’s why we constructed the webshop completely scalable as layout. The layout of the webshop has been established in a number of steps. In a sustained process of pingpong we put what Close-Up had in mind on the screen: a clean, simple design with a focus on the products and photography. The packshots were provided by Tjorven and Studio Arnold Henri. Because online shopping needs to be both fun and easy to use, you can put a look together form the complete collection. We built a module for this in Magento. We only disabled this feature on smartphone simply because the screen is too small. You can shop in different ways: via ‘Look’, via ‘Collection’ or via ‘Categories’, in each case with relevant filters. The screen fills itself with products, because that’s what really matters. Accurate stock management is very important for webshops. In the Magento webshop, orders and communication are managed via e-mail with the customer. The order itself is send to Shopplus. The accounting and logistical matters are arranged in the Shopplus software. Conversely, there is a product synchronization between Shopplus and Magento, in this way the stock is always up to date. The webshop is quick and that’s because of Combell. 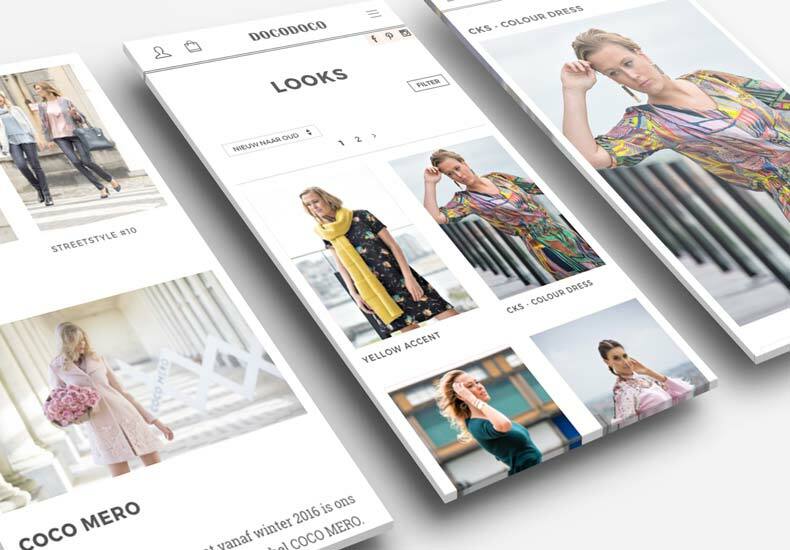 With a cloud server optimized for Magento hosting, the site features a redundant infrastructure and the webshop is ready for further growth. This server is monitored 24/7 and there is a possibility to temporarily scale the server when the online campaigns provide peak load. Combell looks after the fact that the webshop is always online and performant with guarantees for resolutions times. A pleasant online shopping experience requires that you coordinate the application and infrastructure completely. Tina and Liesbeth form Baldwin created the look and feel and eventually the whole design. Leen took the front end development to her account, Pieter and Koen sunk their teeth into the backend, Yannah was responsible for stress & sprint management and Jeroen dit the IE-testing. The eventual result stands or falls with this input of the client. 10 x 0 stays zero 🙂 The Close-Up team consists of four people who all have their own specific talents and complement each other well. Jan Schepens had programmed apparently in a distant past, Katja shook the texts easily from her sleeve, Koen adjusted creatively when needed and Babs kept on seeing the bigger picture. We can conclude that we formed a good team together: everybody had their own tasks and approach and that worked very well as you can see in the result! Normally we choose to do a soft live for new webshops. In that way we can still fix childhood diseases and little bugs and use the first feedback of the visitors to adjust some things here and there. This was impossible with Close-up. Going live means immediate buzz in the media and immediately questions and phone calls of customers. The webshop went live at 11:00 PM and at 1:30 AM the first order was a fact. On day 1 the webshop had to digest more than 15,000 curious visitors: only between 12 and 1 PM we got a load of 5,000 visitors … (Thanks to Combell for the solid server!). Finally, the timing of the project was 3 months … summarized, with a lot of good choices, a lot of feeling for pragmatism and a client who knows what he wants, you can built a successful webshop within an acceptable time. More of that please!